Although generally not much of a sweet tooth, I do have a soft spot for soft serve, get jealous about gelato, am a zealot for zmrzlina… You get the point. As the temperatures rise, so too does the number of vendors around the city offering a variety of frozen treats with which to help keep the heat at bay. 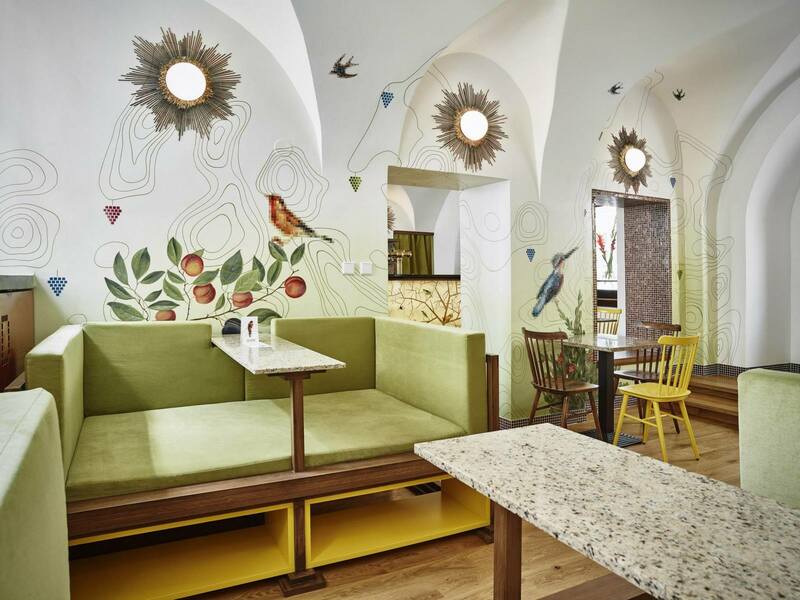 My money for the best scoop in town is on a relative newcomer created by a Brno institution. Starting last year, the well-known confectionary Tutti Frutti began scooping up delicious homemade ice creams with unique flavors. What’s more, they’re vegan (if you’re into that sort of thing; if not, don’t be deterred). 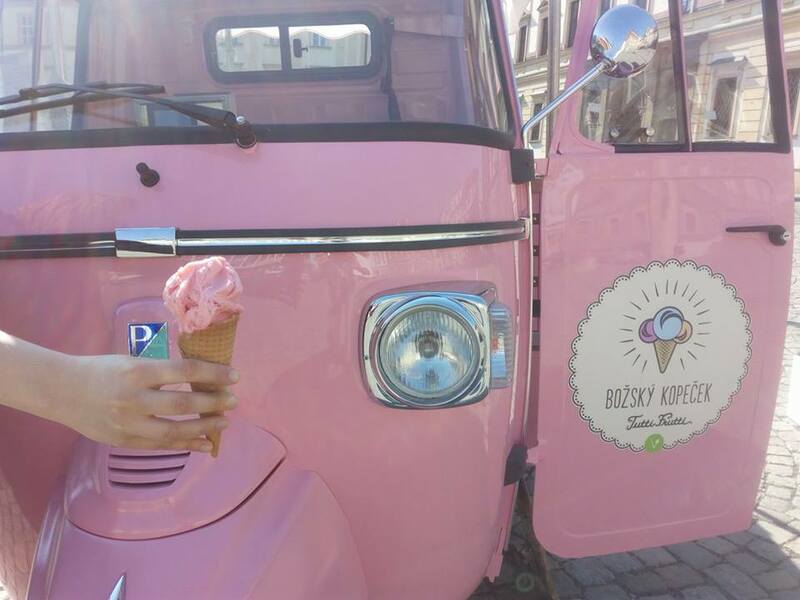 Branded as Božský kopeček (aka The Divine Scoop), they’ve upped their game this summer with four retro gelato trucks painted in pastels. On any given sunny day you’ll find one at Zelný trh, another at Lužánky, and more recently more at Moravské náměstí and náměstí Svobody. Each offers a changing menu of some 6 flavors, ranging from the relatively familiar (forest berries) to the more exotic (jackfruit with Thai basil and chili). Nut-based flavors (hazelnut, peanut butter) and fruit-herb combinations (blueberry with lavender) also feature heavily in the rotation. There is always something to entice both the traditionalist and the gourmet. Being vegan, and therefore non-dairy, the consistency of the fruit flavors tends to fall somewhere between sorbet and ice cream. But the apparent abundance of fruit that goes into them, and probably the use of coconut milk or other alternatives, really tilts the scale towards creamy. As for the nutty flavors, they have a richness that seemingly belies the label ‘vegan’. I typically go for two scoops – the exotic flavor du jour plus whatever else might offer an interesting counterpoint or combined flavor profile. Most recently, it was acai and peanut butter. I was a bit skeptical at first, but having overheard the acai described as chocolatey I decided to give it a go. Lo and behold, the acai tasted richly of berries with a subtle cocoa undertone. It was phenomenal and did indeed pair well with the equally delicious and rich peanut butter. If this were Berlin, Brooklyn or London, the word ‘artisanal’ would probably be thrown around when referring to Božský kopeček. But this is Brno. No bourgie pretention here. Díky bohu. Just a delicious product made with dedication and passion. Simply divine. 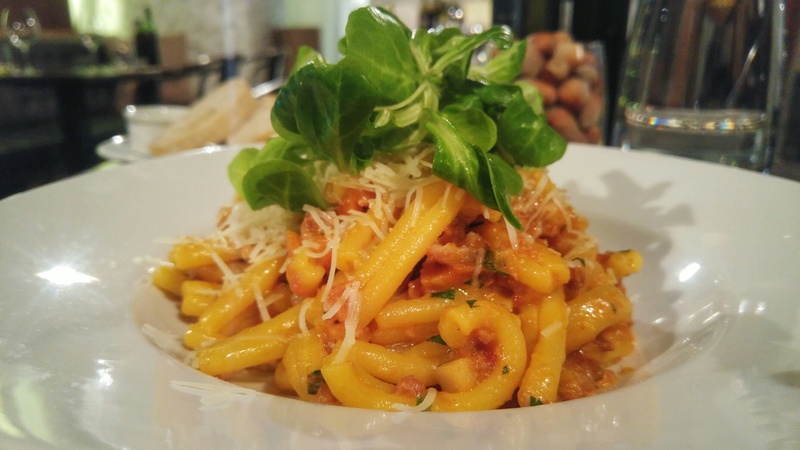 There is now a cornucopia of options covering cuisines from around the world in Brno. Two cuisines that are relatively lacking, however, are North African and Middle Eastern. Café Pilát fills this void.